I know it's sooo late for an April favourites post, but you should be grateful that there is one at all hahaha!! 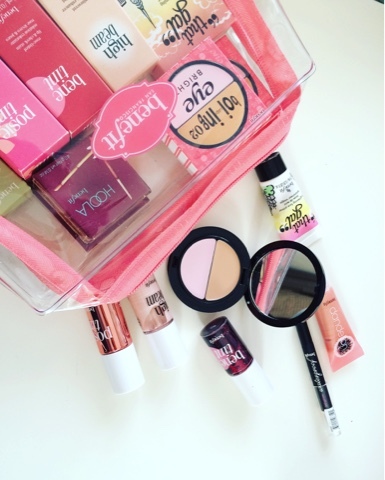 I bought loads of Benefit products in April so I thought I'd dedicate this post to the brand (NOT sponsored). So as you can see I went all out and bought nearly every single travel-sized product that Benefit does. As Boots had an offer on the minis (4 for £15 + free makeup bag) I bought 8 products from the offer and one travel-sized Hoola bronzer which was £9.95. I absolutely love every single product I had bought, especially the baby sized Hoola! I definitely recommend all these product for those who are travelling light this year or want to save space in their makeup bags! Have you tried any of the products mentioned above? What's your favourite? Hoola is my go-to bronzer I love the shade! I didn't realise Boots had this offer on, I think I need a trip!